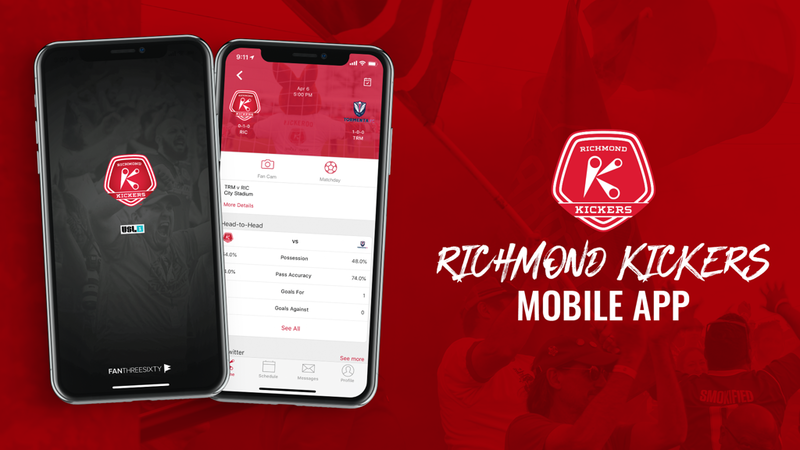 RICHMOND, Va. – (Tuesday, April 2, 2019) – The Richmond Kickers have launched a new app in partnership with FanThreeSixty and the USL, available now in the Apple App Store and the Google Play Store. With fan experience as a center of the club’s mission and ambition, the new App will open up new and more interactive channels. Features extend beyond team announcements, roster/player insights, schedule, ticketing, merchandise, and stadium information. One example is the Matchday Fan Cam allowing fans to take photos featuring several Kickers filters to share on social media. Plus, in game pushes will include timely updates such as starting line-ups, video highlights, game photos and fan polls. "We appreciate the opportunity to bring Richmond Kickers' fans a more personalized experience through our integrated mobile app and fan engagement platform," said Jason Houseworth, CEO, FanThreeSixty. "Together, we're giving fans what they want, when they want it, while helping the Kickers better understand their fans in order to constantly improve the fan experience."